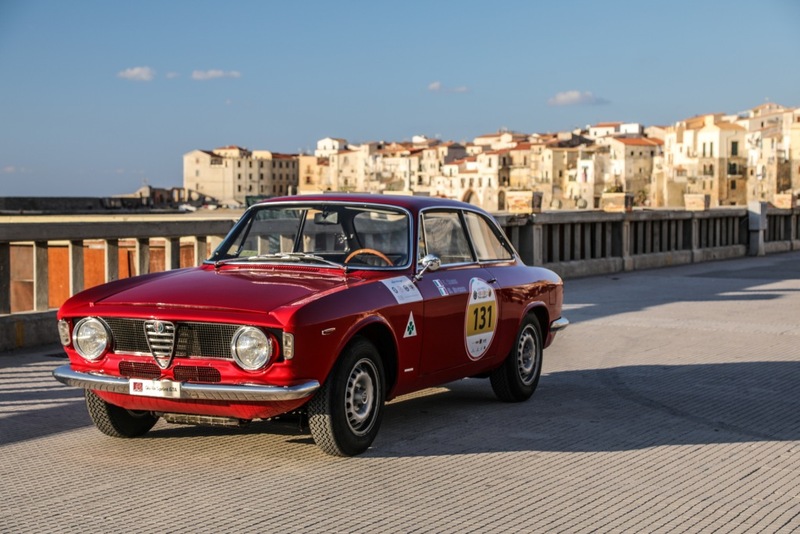 This weekend, Alfa Romeo showcased its prestigious racing heritage at the 101st edition of the Targa Florio, the world’s oldest automotive race, held in Sicily, Italy. 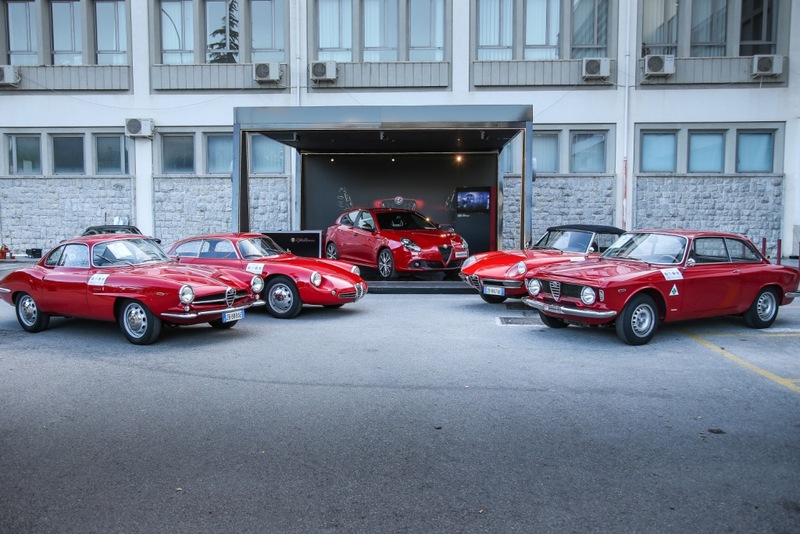 A title sponsor of this year’s event, Alfa Romeo provided cars from its extensive collection at the Museo Storico Alfa Romeo in Arese for the Classic race. 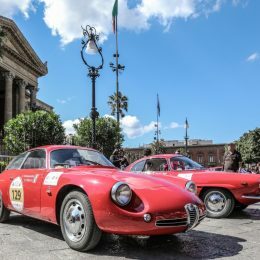 Some of Alfa Romeo’s most impressive racing models from the 1960s including; an Alfa Romeo Giulietta SZ, Giulia Sprint GTA, Giulia Sprint Speciale and 1600 Spider Duetto joined the line-up of historic cars. 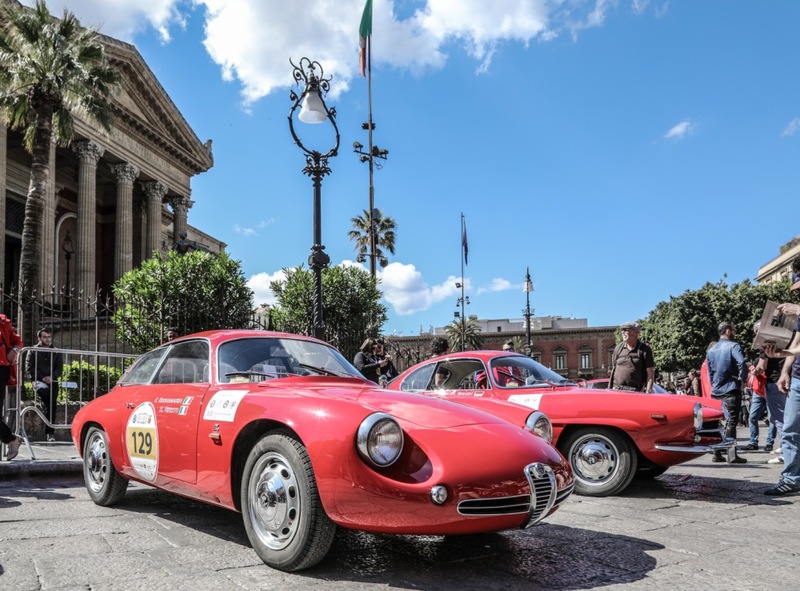 Starting at the Piazza Verdi in the capital, Palermo, the three-stage race passed through 305 kilometres of beautiful Sicilian countryside, including Caltavuturo, Castellana Sicula, Petralia Sottana, Geraci Siculo, Castelbuono, Termini Imerese and Trabia. Driven by Roberto Giolito, Head of the FCA Heritage Department, the Giulietta SZ features a distinctive ‘cut-off rear’, disc-type front brakes and tapered nose, offering efficient aerodynamics that allow it to reach 200 km/h. Under the bonnet, a 1290 cc four cylinder engine is capable of generating 100 HP. 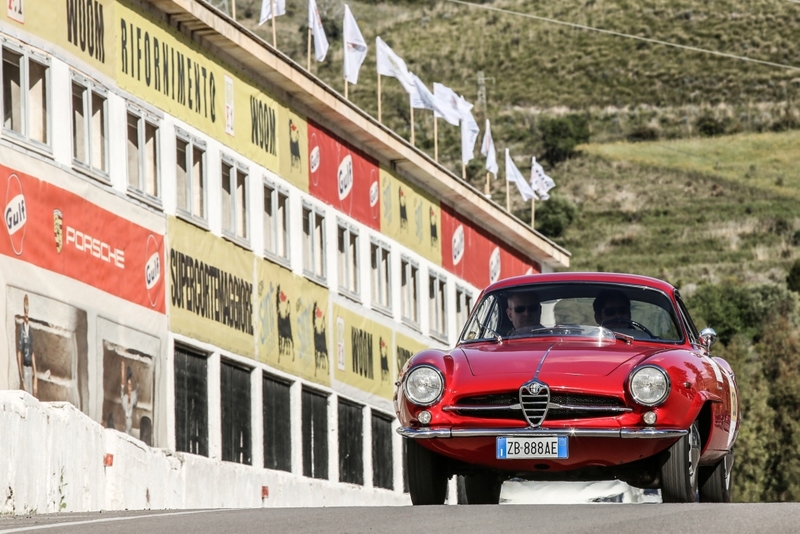 The Giulietta Sprint Zagato has its roots in racing. 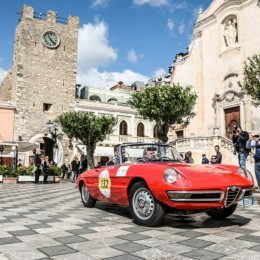 In 1956, Dore Leto di Priolo, one of Italy’s best known gentleman drivers of the time, badly damaged his Giulietta Sprint Veloce during the Mille Miglia. When he took it to Zagato for repair, Dore requested that the weight was reduced as much as possible, even if it proved complex and expensive. In response, Zagato removed the panelling from the chassis, fitted it with a lightweight tubular steel structure and covered it with an aluminium body. The result was the SVZ, a more rounded, contoured car with greatly improved aerodynamic prowess that lent itself to success of the race track. Alfa Romeo transformed Zagato’s design into a ‘standard’ production model, based on a shorter chassis, and production began on the Sprint Zagato in 1959. 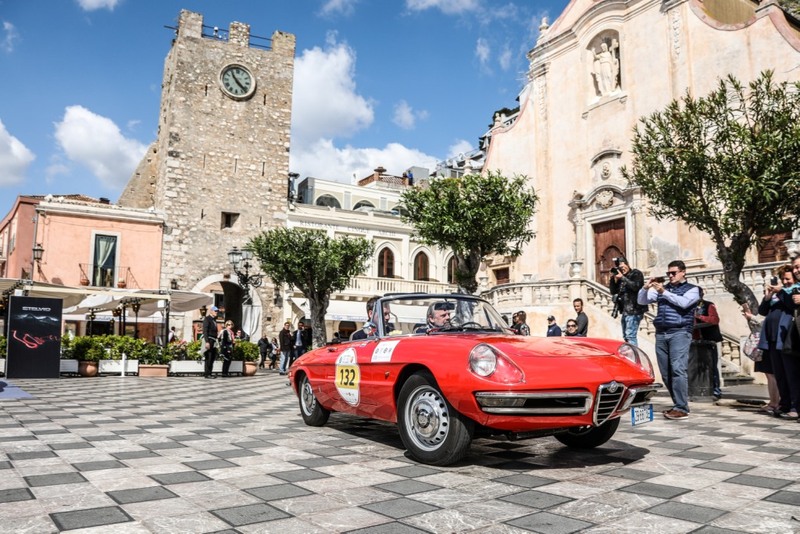 The model taking part in the 101st Targa Florio is the second version, produced in 1960. 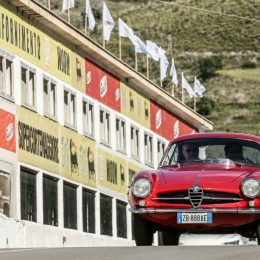 Known for its racing prowess, the Giulia Sprint GTA is similar to the standard production ‘GT’ cars with bodywork by Bertone. However, the ‘A’ in the name stands for ‘Alleggerita’ or ‘lightweight’. The steel bodywork of the standard Sprint GT was replaced by ultra-light alloy panels and 14” magnesium wheels, cutting the car’s original weight by more than 200kg. A modified 1570 cc twin camshaft engine could produce 115 HP and a top speed of over 185 km/h. 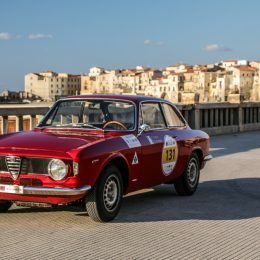 The Giulia GTA was piloted by Fabrizio Curci, Head of EMEA Alfa Romeo brand and Giorgio Zivocci, grandson of Ugo Sivocci, who won the Targa Florio race in 1923 behind the wheel of an Alfa Romeo RL. Ugo Sivocci was responsible for the iconic four-leaf clover on Alfa Romeo cars; his car in the 1923 Targa Florio race was adorned with the green four-leaf clover and his victory cemented its status as a lucky charm. 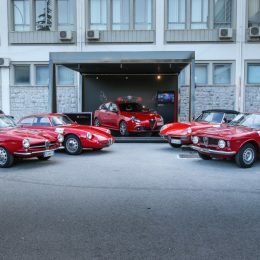 An evolution of the Giulietta version, the Giulia Sprint Speciale was designed by Franco Scaglione to be an extremely low, streamlined coupé with sleek, curvy lines. The Giulia Sprint Speciale is distinguishable by its absence of bumpers and large ‘shark mouth’ radiator and achieves an impressive performance; 113 HP and a top speed of 191 km/h. A masterpiece in design, the 1600 Spider Duetto features an unconventional design with a low nose and tapered ‘cuttlefish bone’ tail. Boasting 109 HP and a maximum speed of 182 km/h, the Duetto became iconic thanks to its appearance in the film ‘The Graduate’, driven by Dustin Hoffman.